I have only ever been to one Sale Barn before. When I was there I was certain I could have bought every horse there and taken it home. Well, not every horse, but most of them. I have not been back to the Sale Barn since. I have this theory about the Sale Barn. The horses that get run through go there for a reason. Most reasons are not good ones. I bought a pony from a "horse trader" who frequents the sale barn. 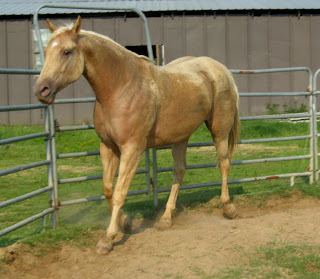 He was a cute palomino pony that was very sweet. Until he came home and I cured him of his stomach ulcers. It's amazing the energy that a pony can have when he feels better. 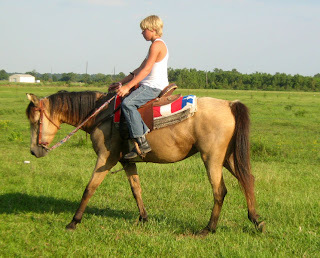 It took us about two years of riding and hauling that pony to playdays to get him to the point that a kid could ride him. 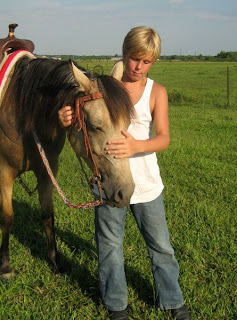 Then we sold him to a little girl who now runs barrels on him. My father in law goes to three different sale barns about two to three times a month. Then he comes home with horses like these. This is Magic. She is about six years old now. This is the special horse that trampled my darling Little Cowpoke when he was two years old and we spent the night in the hospital. That was back in March. They bought this horse because my mother in law thought she was "pretty". I think she just was looking at the color. They had put Magic up for sale because the 11 year old boy for whom they bought the horse for was too scared to ride her. So, in preparation for selling the mare, my father in law did a lot of round pen work with Magic. Now, the 11 year old rides the horse and they have decided to keep her. She still has her "weird" moments, but she is still really green. So, is her rider. I have a saying, "Green and Green make Black and Blue". But that is just me. Then there are the most recent finds. This is Shotgun. 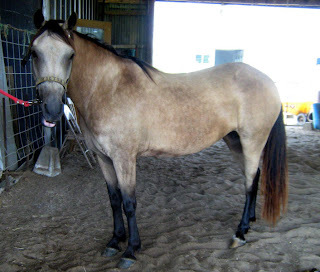 This little pony mare was bought from the horse trader. She is a good little pony, unless you want to bridle or saddle her. Once you do get a saddle on her she is very good to ride. I tried to bridle her and she acted like that had never happened before. So, I put a hackamore on her and the little 10 year old rode off into the sunset. 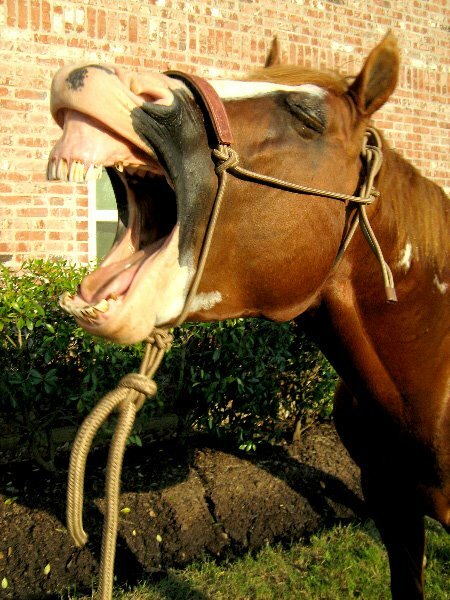 Then there is this mare. My father in law wanted to call her Blondie, but then she got the name Little Bit. This horse went through the sale barn with the story of how she was used for a police horse and for rescues. She sure has the size for a police horse, but she doesn't stand still. I have seen mounted policemen with their horses and those horses don't move for anything. You can't get on this mare unless you can mount a horse at the speed of light. 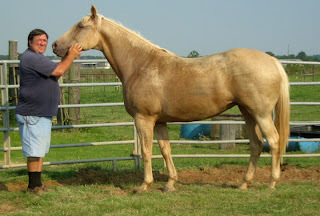 But my father in law needed this horse because of her size. He wanted a big horse to ride. Now all he has to do is get her to stand still while mounting. He only has one leg and so he needs a stool to stand on. He has tried to get her to stand still. My father in law has worked her in the round pen too, just to have her try to jump out and totally bend up an entire panel. Nice. You just never know what you are going to get at the sale barn. Oh, and I received a phone call last night from a friend of mine saying that Chip, the horse that I have been riding, is for sale. Chip's owner wants me to buy him. 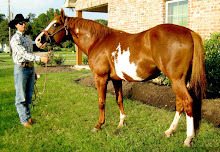 The owner paid 8,000 for this horse two years ago and he wants to sell him to me for 2500 dollars. Too bad I don't have 2500 dollars to spend on a horse. Chip is a son of Zips Chocolate Chip. The stud fee for Zips Chocolate Chip is 4500 dollars. It is such a good deal, but it just is at a really bad time for our family right now. Oh how I would love to have a super nice western pleasure horse. I have been to the sale barns numerous times, used to work them with the vet. I think, in my opinion you have to be very careful when you buy something from the sale barn, there are diamonds in the rough, but they are few and far between. I think the person shopping at the sale barns needs to be a knowledgeable horse person and be able to read the horse. There is a couple at our church, we are not horse people, that keep buying these horses from the sale barns and they keep wondering why they are getting these junk horses that tries to hurt them. Well, problem is there is alot of us that has tried to help them and they won't listen. I pray everytime one of them rides them they are okay! Hubby is a firm believer you get what you pay for. He also mounts me well, which I am very thankful for. It continues to amaze me what people will mount there loved ones on! Having said you get what you pay for, I don't necessarily mean you have to pay a fourtane, but if it is a dirt cheap deal, it may not be the one for you. I'm interested to see what everyone else has to say. Oh and a horse that won't stand still when you are mounting! That is just unacceptable, period! Have a great day girl!!!! I've never been to a sale barn because I'm a sucker. My sister, however, just got a lovely little pony for her daughter. He's still young but has much potential. In regards to standing when mounting, my sister's mare had that issue a few years ago and she tried a Clinton Anderson method that worked well. Basically, I think she kept a halter & lead line on under the bridle, picked up the reins, and went to mount. 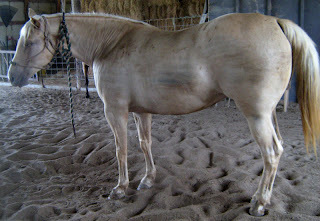 Whenever the mare began to step forward, she immediately stepped out of the stirrup and sent the mare into small circles around her, trotting. Then asked her to stop and stand still and remounted. It took a lot of circles and one tired horse for the mare to realize it was better to stand still and not have to work so hard! The trick is to make the horse think it was their idea. One more thing, I see many people mount up then ride right off. It's best to mount up and sit for as long as you can. Then the horse doesn't develop the assumption that mounting up always means GO. That is one beautiful big mare, that Little Bit. I really like her build! Little Bit is beautiful and pony girl's ideas for fixing her problem are good. I am sure with patience this will be a problem you can fix. Sweet William has a few problems and one of them was bitting too, but Karo syrup on the bit cured him real quick. Now he drops his head way down low (which is good cause he is 61/2 hands tall). It is a simple fix. We have been doing it most every time we bit and we will gradually withdraw the sweet stuff, but by then he will be reprogrammed. The other day during the trail ride I bridled him numerous times because I had to keep tying him up and he still dropped his head even though he couldn't smell the Karo, so I totally know it is working. Good luck. It is a very worthwhile cause to rehabilitate horses. Here in the wild west they sell wild horses that you then have the pleasure of breaking. Interested? I love sale barns. I miss walking through the pens and letting some horse pick me. They "talk" to you, you know. I always buy from the loose pens. Almost everything is just simple training issues. 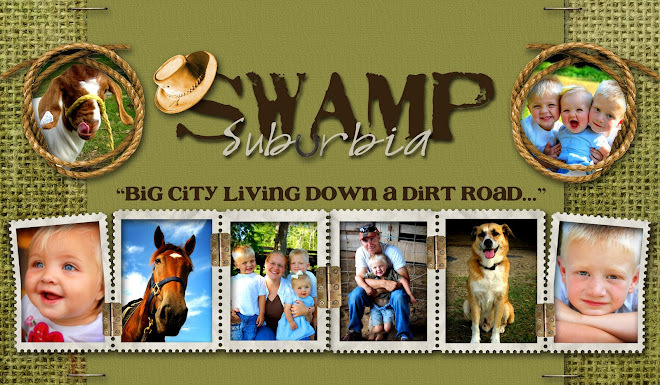 A couple have required chiropractic work and some need dental work. I have only ever been burned by one horse-he lied to me when he "said" he was nice-he was a rank SOB and eventually I reinstated his one-way ticket. Even then he didn't end up going to kill-some guy fell in love with him(he was a gorgeous Appy)and took him home to use as a pack horse-LOL. I always wondered how that worked out??? But yea-once I get the holes filled in, the rest of them have turned into fantastic using horses and all ended up in family homes. What I would really like to be able to do is take them back to their previous owners and show the jerks just how good the horse they dumped turned out. Maybe they would get the hint it wasn't the horse's fault??!! Lil Bit is gorgeous. Has anyone else got to ride her yet to see how she does under saddle? Is mounting her only issue? I found your Sale Barn Horse Experiences very interesting. Thanks for this post. Like Pony Girl, I'm too picky...and also inexperienced, so buying a horse without a well known background....with issues, is just not in the cards for me.